A treadmill can give you a great walking workout in any weather. If you use the right walking form and vary your workouts with intervals, hills, and speed changes, you can keep yourself interested and challenge your body in new ways. A key to getting the most out of your treadmill workout is to walk with the same good walking form you use for walking outdoors. Learn how to use good walking posture and avoid common treadmill walking mistakes. An important factor is to train yourself to let go of the handrails on the treadmill. You will burn more calories and improve your balance, among other benefits. Get to know your treadmill features, especially if it has heart-rate controlled workouts that can vary the speed and incline to keep you in your workout intensity zone. You can use the treadmill to get the cardio exercise that will burn extra calories and support a weight loss plan. Follow this treadmill weight loss weekly workout plan that varies the type of workout throughout the week. It challenges you in different ways to keep your body burning excess fat. Lorra Garrick, CPT designed these treadmill workouts for walkers for variety and to add intervals of higher intensity or challenge your muscles in new ways. Warm Up and Cool Down: For all workouts, start at a low speed and incline for at least two minutes Adjust your walking posture and concentrate on good walking form. Then you can increase the speed and incline for your workout. At the end of your treadmill session, reduce the speed to an easy pace for one to three minutes. A steady pace workout allows you to meet the suggested daily requirement for moderate to vigorous intensity exercise for good health, fitness, and weight loss. Once warmed up, set the incline and speed so your heart rate will reach the moderate-intensity zone. Walk in this zone for 30 minutes or more. Raise the incline one percent every week or two or increase the speed. Walk a high incline for a two to five minutes, then reduce the incline to level for two minutes to recover. Alternate tough, high inclines with easy, low inclines at a fixed speed for 30 minutes. Do not keep the incline high for your easy intervals. Instead, lower the angle to mimic going downhill or level as you would in the outside world. See more treadmill hill workouts. Maintain a 10 to 15 percent grade, but vary the speed. For instance, alternate one-minute intervals between 4 mph and 2 mph. Use the highest speed that will bring you up to a vigorous-intensity effort where you are breathing so hard you can only speak short phrases. The lower speed should be moderate intensity allowing recovery before you increase the speed again. If you are ready for a fitness challenge, set your training intervals at a grueling intensity (6 mph at 15 percent). Your high-intensity intervals may only last 15 to 30 seconds. Your one- or two-minute recovery intervals can be a flat level walk at 3 mph or a 2.5 mph walk at the 15 percent incline. You will change your workout dramatically for your muscles, coordination, and balance by adding intervals of walking backward on the treadmill. You will need to slow the pace dramatically and build up your time in doing them, but you'll feel the difference in your thighs. Do you want to work on your upper body strength as well as your cardio? You can use your treadmill time as the cardio portion of a circuit workout, alternating with getting an upper body workout with dumbbells. Place your dumbbells next to the treadmill. After your warm up, pick up the pace for 5 minutes. Slow and pause the treadmill. Get off and use the dumbbells to do lateral raises. Then back on the treadmill for 2 minutes at a brisk walking pace or jogging pace. If you want even more variety, incorporate some skipping and hopping into your treadmill workout. You should try this only if you are confident in your balance, and be sure to use the safety stop cord. Skip or hop at a very slow speed for 15 seconds to get a feel for it. You can add this as intervals to spice up your usual treadmill workout. Many people get bored when using the treadmill. Varying your workout as above is one step. You may use a treadmill that includes virtual trails with the iFit system or by using an app. 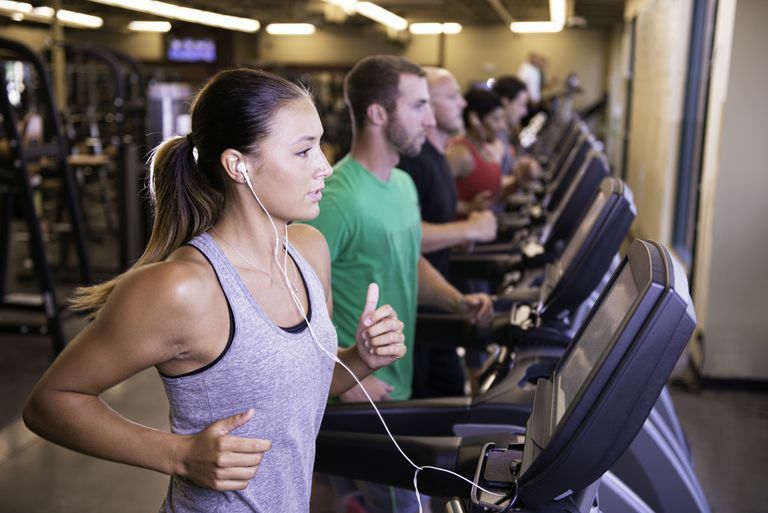 Other ways you can beat treadmill boredom and entertain yourself as you workout include watching video and listening to music, podcasts, or audiobooks. Having a treadmill workout buddy can also keep you motivated. At the gym as well as at home, be sure to wipe down the treadmill to keep it clean for the next user. Moisture from sweat can lead to corrosion. Pay attention to any noises that develop as they are early signs it needs repair. Be sure that you vacuum under it regularly to eliminate dust and lint that can gum up the mechanism. Other home treadmill maintenance tips include checking the walking belt and deck monthly and lubricating it at least once per year.